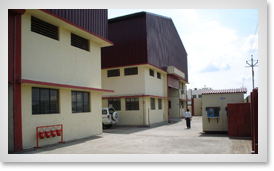 Sharada Industries (SI) started out in 1974 and worked as Weldo Works with a handful of people. The proprietor and founder of the company Mr.Prabhakar Modak (Also known as Balasaheb), started his career in Philips and was part of the production line at Philips in India. However the dream and yearning to start up a business of his own was strong. So Weldo Works started out with odd jobs and making benches for schools,soon Mr.Modak got work from TATA Motors to manufacture storage bins. Gradually as TATA Motors (then TELCO) started making its own trucks it started looking for potential sheet metal fabricators. As this was a new venture Mr.Modak decided to change the name of the company to Sharada Industries in 1982. Initially the raw material was supplied by TELCO and an assembled part was fabricated by SI and in a few years the company was able to garner sufficient financial strength to buy its own steel. Today Sharada Industries buys over 800 to 1000 MT a month.Like any new company it faced its share of struggles and successes but it was able to stand the test of time for the past 28 years. The company has grown from 3 people to over 100 people and from one manufacturing unit to 10 units all in the Bhosari, MIDC. 1976 Started as a small company manufacturing for TELCO Growth Div. 1982 Moved to Bhosari MIDC started job work for TELCO. 1995 Developed Assy. Lower Wishbone, Assy. Top Wishbone and Cross Member Front with own material for Sumo. 1997 Started body building of Sumo into army and regular ambulances. 2002 Moved to Bhosari MIDC started job work for TELCO. 2007 High Tonnage Press Shop Line (upto 600 tonnes) with Mechanical and Hydraulic Presses. Xenon Underbody floor substructure, Robotic Welded Lower Wishbone, Top Wishbone. 2008 Development of Sumo Armored. Start of Development of Cross-over line. Our Vision is to become a reliable, quality conscious vendor partner to our customers. We are intent on carrying out manufacturing activities that shall benefit our associates, surroundings and society.